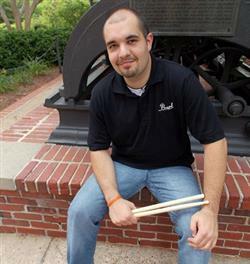 Brandon Beck is a freelance percussionist currently living in Irmo, SC. From Irmo, he operates his company BBeck Percussion which specializes in arranging and composition services, as well as providing private lessons to percussion students. Brandon was a member of Drum Corps International performing with the Santa Clara Vanguard Cadets (07-09) and the Boston Crusaders (2010) for his age-out summer. He was also a member of Winter Guard International with Odyssey Percussion (06 & 07), Frequency Percussion (08) and Pariah Percussion Theater (09). Brandon is currently the lead Tenor Tech for Music City Drum and Bugle Corps based out of Nashville, TN. Previously, Brandon was on the percussion staff for the Crossmen Drum and Bugle Corps in 2014. In 2013, he served as a percussion instructor for the Macy’s Great American Marching Band that performed as the opening act for the Macy’s Thanksgiving Day Parade in New York City. Brandon has worked with numerous high schools in Georgia, Alabama, South Carolina and Ohio. During the school year and summer, Brandon teaches private lessons and works with local high schools. As an arranger, Brandon has written on both the high school and collegiate level. Throughout his career, Brandon has had the privilege of being taught by outstanding teachers including: Mr. John Cypert, Mr. Heath Lawless, Mr. Hunter McRae, Mr. Kohei Mizushima, Dr. Omar Carmenates and Dr. Doug Rosener. While attending Auburn University, Brandon performed with the Percussion Ensemble, Symphonic Band, Concert Band, Campus Band, Orchestra and the Auburn University Marching Band. Brandon has also been a performer with the Atlanta Falcons Drumline. During the summer of 2013, Brandon earned a summer internship with the Pearl Corporation. Brandon is a member of the Percussive Arts Society and performs exclusively with Innovative Percussion sticks and mallets.